Do you know the most common cause of death among young men under 35? All told 90% of us do not know that the answer is suicide. A new survey by YouGov published to mark the launch the CALMzone in London today also shows almost one in three Londoners say they know someone who has taken their own life. The charity warns of a silent death toll of young men. CALMzone offers a free charity helpline - 0808 802 5858 - and text service for young men at risk of suicide in London. Look out for a series of striking billboard ads at prime London sites such as Westfield announcing the initiative. 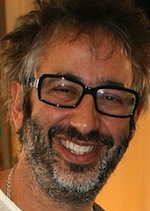 David Baddiel, patron of CALM, the campaign against living miserably, said: 'Nine out of ten Londoners do not know that suicide is the single biggest killer of young men in the capital, and nearly half the population in London incorrectly believes either that knife and gun crime (25%) or road accidents (24%) pose a greater threat to young men’s lives than suicide (10%). Topman is supporting the launch with an eight-hour star-studded session of DJs battling it out at Topman in Oxford Street. The launch follows the success of CALM’s helpline in Merseyside, which has helped reduce young male suicides in the region by 55% over the past 10 years. Supported by a grant from City of London's City Bridge, CALM has been commissioned by Inner North West London Primary Care Trusts covering Hammersmith & Fulham, Kensington & Chelsea and Westminster. The service begins 26 November 2011. CALM would like to see other PCTs in London to commission its services, particularly those areas where the suicide rates are higher than the national average. The CALMzone helpline number is 0808 802 5858 - it’s free, confidential & anonymous. The text helpline number is 07537 404717 – first-time users should start their first text with CALM1.